Hello TPM members, and welcome to the weekend. We got the Mueller report, and though we’ve read its contents, it’s not yet fully clear what it will mean for the next few months of politics. We’ve got plenty for you to read, however. Here’s what happened in Prime. Going into this week, we knew we’d get the Mueller report — and on Monday the Department of Justice told us when: Thursday. That announcement reportedly set off a wave of anxiety among White House officials about what the report would reveal they told the special counsel. We’re continuing to sift through the Mueller report. Within the 400-plus pages are insights on stories we’ve been following for years. Here’s some of what you can expect today. Among the 1,092 footnotes in the redacted Mueller report, we recognized a familiar name: ours. Once we get our hands on the redacted Mueller report, we’ll be updating this post with tips to help you read it yourself — who unnamed people are, what the redactions seem to deal with, that kind of thing. Check back. It’s Mueller report day. Perhaps you heard. Here’s how we expect stuff to play out. In the wake of the fire at Notre Dame, conspiracy theories flourished among far-right and Trump-boosting Twitter accounts. Here’s more on that and other stories we’re following. Ex-lobbyist David Bernhardt was confirmed as Secretary of the Interior on Thursday, April 11. Today — Monday, April 15 — we learn he is under investigation by Interior’s Inspector General. This is the week. Theoretically. 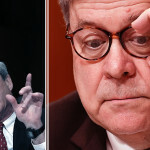 Attorney General Bill Barr said last week that his redacted version of the Mueller report would “hopefully next week” — so, by Friday. That said, there’s plenty else going on. Welcome to the weekend. This week saw a number of Trump administration officials — Attorney General Barr, Treasury Secretary Mnuchin, IRS head Chuck Rettig — go before Congress to answer uncomfortable questions (more on that below). In at least one instance, it got intense. Here’s what happened in Prime. This week saw the Russia probe go bipartisan, indicting a Democratic D.C. operative who worked alongside Paul Manafort in Ukraine. Josh Kovensky, who covered Craig and Manafort’s work in Ukraine from Kyiv, delves into exactly what they were up to. Georgia’s controversial exact match law is dead. Kate Riga goes deep inside the fractures within the Texas gun rights community — and an attempt to pass permitless carry that backfired spectacularly. Kate Riga runs down the casualties of the purge. Various reports indicate that Trump fired (or was convinced by Stephen Miller to fire) Nielsen and others at least in part because they refused to break the law on his behalf. Josh Marshall provides some background on the new DHS chief. The more Trump and his allies complain about Democrats’ request to see his taxes, the more he makes the legal case that their request is necessary. Josh Kovensky explains how. “Barr is making his decision quite clear here,” Josh Marshall writes of Bill Barr’s testimony. He will decide which parts of the Mueller Report become public. A reader writes in on Barr’s spying comments. A reader shares a map of where coal — the worst contributor to climate change — is more expensive than renewables. In a series of three posts, Josh Marshall digs into the charges against Julian Assange. One, two and three. Uh oh: Devin Nunes has another lawsuit.